Looks like our prediction of Research In Motion making SXSW a venue to demo the BlackBerry PlayBook is starting to ring true. Hopefully we'll see some more press releases along the way but in the meantime, some great news for music fans has come out of the press release below. Research In Motion have again teamed up with 7Digital to provide users with a store-front for music purchases only this time on a much larger scale. LONDON, UNITED KINGDOM and WATERLOO, ONTARIO--(Marketwire - March 9, 2011) - Research In Motion (RIM) (NASDAQ:RIMM)(TSX:RIM) and 7digital today announced that the 7digital Music Store will come pre-installed(i) on the BlackBerry(R) PlayBook(TM). The 7digital Music Store will give BlackBerry PlayBook users access to 7digital's catalogue of over 13 million high quality (320kbps) MP3s. BlackBerry PlayBook users will be able to search for tracks, albums and artists and preview tracks before making a purchase. Users can also discover new music through 7digital's recommendation technology. Prices for BlackBerry PlayBook users will match the prices on 7digital.com, with individual tracks and albums priced in a customer's local currency. Ben Drury, CEO 7digital comments, "We're really excited to be working with RIM to bring the 7digital experience to the BlackBerry PlayBook. RIM has created an incredible tablet with premium multimedia features and together we are delivering a truly exceptional music experience for mobile users, offering content that is extremely easy to discover, purchase and use. "The 7digital Music Store is a perfect complement to the high-performance BlackBerry PlayBook, providing users with fast searches and downloads, and a slick interface that makes it very easy to discover, purchase and enjoy music," said Alistair Mitchell, Vice President, BBM Platform & Integrated Services. "We are thrilled to be working with 7digital to provide BlackBerry PlayBook users with access to an amazing catalog of 13 million tracks." 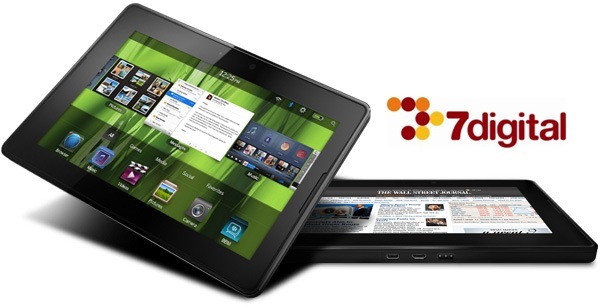 The BlackBerry PlayBook tablet running the 7digital Music Store application will be previewed this week at the South by South West conference in Austin, Texas. (i) Certain territorial restrictions may apply. 7digital is a leading digital media delivery company based in London and operating globally. Through 7digital's download store (www.7digital.com) consumers can access over 13 million legal high quality MP3 music tracks as well as audiobooks and videos at competitive prices across Europe and North America. Combining 7digital's secure and robust technology platform with the broadest agreements in the digital media industry, the company provides comprehensive digital download services to a wide range of partners around the world. 7digital has worked with record companies, artists, FMCG brands, retailers, consumer electronics companies, fashion brands, advertising agencies and many other organisations to harness the power of digital entertainment, music, video, audiobooks and ebooks, to engage customers. For more information visit www.7digital.com/business. 7digital has provided digital media services to over 500 partners including: RIM, Samsung, Toshiba, HMV, Spotify, Imagination Technologies, Universal Music, EMI, Warner Music, Sony Music, Waterstone's, AOL/Winamp, Imerge, Nestle, Hugo Boss, Yahoo!, Amnesty International and Adidas, and have delivered tens of millions of digital products in over 30 countries.